The Flashtract team is pictured after winning the Tiger Cage competition. Auburn University students Ben Conry and Blair Chenault were told last spring that their idea to streamline the construction industry payment processes with computer software was not realistic. And that stung—particularly coming from a pitch competition judge. Conry and Chenault found jewels in that failure, dusted themselves off and got back to work. 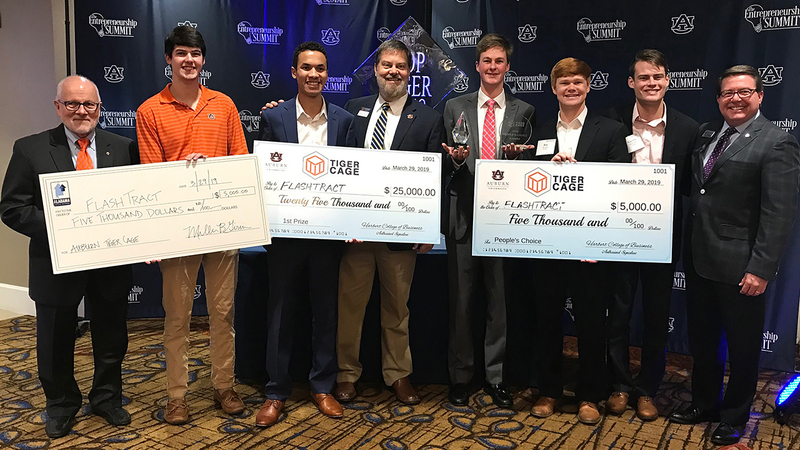 Two days after winning first place and $50,000 at Wednesday’s Auburn Regional Alabama Launchpad pitch competition, their team “Flashtract” won $35,000 at Auburn’s fifth annual Tiger Cage student business pitch competition Friday, March 29. Presented by the Raymond J. Harbert College of Business, Tiger Cage identifies and rewards the best early-stage products, services and business concepts that emerge from Auburn students. The team’s software that saves construction project stakeholders, subcontractors and project-owners valuable time and expedites the payment process, found the industry professional judges’ favor in the Tiger Cage final round. “There’s no way Ben and I could have done this by ourselves and made this much progress,” Chenault said. But Flashtract wasn’t the only student startup to take home prizes. Precision Performance Insoles, a device placed within insoles that maps foot structures for comfort, took the $10,000 second place prize for team members Jordan Coker, engineering, and Mohamed Badawy, engineering. Fourth place and $4,000 went to Alabama Boat Club, which provides customers with watercraft they can use rather than own. The team included Chad Matthews, business; Henry Brown, business; Matt Heffren, business; and Parker Jones, business.